What are we really doing in our lives is a question that should be asked. This can be considered in the context of a personal mission statement, life goal or vision for our life. Or it’s often asked rhetorically at a time of anguish or frustrated wandering. Most often it is not addressed at all as we are too busy doing what is front of us today which requires or even demands our full attention and obligation. In business it is our objectives; in life we typically think in terms of worldly goals and dreams – I want to go to Paris, I want to lose 20 pounds, I want to live on the beach someday, I want to start my own business. Most of us keep ourselves busy and targeted with these generalized dreams, goals and objectives that drive our lives. 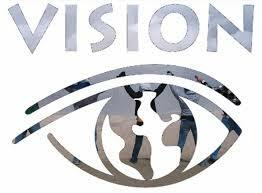 In a Christian context, the vision-thing implies the prophetic. What is God saying to us? What does God want me to do? Oswald Chambers draws a distinction between an ideal or human objective/goal and a vision or God-inspired directive which imparts a moral incentive or Godly nudge that is really an obligation. Indeed as the proverb states “When there is no vision, the people perish” or also translated “When there is no prophetic vision, the people cast off restraint” – that is, once we lose sight of God we begin to be reckless, we cast off guardrails, we stop praying, we act on our own initiative. Once we’re on this downward path, we’re on our own – we’ve lost the Godly vision. Unfortunately this happens all the time. Spirit-led thoughts and dreams drowned out by distractions and the cares of the world. For years now I’ve had a vision/picture in my mind of myself as an old man, a Christian patriarch with my grown children, their spouses, and numerous grandchildren and even great-grandchildren surrounding me sitting on a chair. All of them followers of Christ. For a long time I did not truly understand this image; today I do. I believe it to be God-inspired. Today in my middle age I have 3 married children and 3 grandchildren and another due this summer. By the end of this year my wife of 34 years and I will have grown from the 2 of us to a family of 12. The picture – the vision – is developing. My prayers now are refocused, that out of a reborn life I live up to that vision of patriarch, of father, husband, grandparent, mentor, wise counsel, spiritual family head. It drives, moves and directs me in all things as a “moral incentive” to fulfill the dream vision God has given me. My standing and status in the world is not my dream/vision, it is merely the current context in a larger story. In that larger view my dream/vision is to fulfill all that God would desire to have me be for His purposes.